On the UK's most northerly island this slice of Georgian grandeur stands perfectly proportioned. Belmont House is a beautifully restored and perfectly proportioned Georgian mansion overlooking Bluemull Sound - the strait of water that runs between Yell and Unst. This fabulous example of fine 18th-century architecture has been rescued from a near-ruinous state, and now offers accommodation that is both comfortable and cosy amid splendid surroundings. Built by Thomas Mouat in 1775, the house has all the design features expected in the grandest buildings of its period - symmetrical frontage, quadrant walls, advanced pavilions and policies running down to the sea. There is nothing else like it in the Northern Isles. Sleeps 8. Set over three storeys, the accommodation comprises: an entrance porch and arched hallway on the ground floor, which lead on to a hand-built kitchen with an excellent range and granite-topped wooden units. There is an impressive dining room and a family room (with sofa bed) while a large shower room with WC sit at the back of the house. 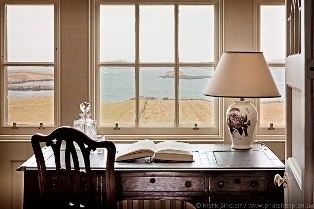 The first floor has a magnificent drawing room with windows to three sides, while Thomas Mouat's writing room with its tall Venetian windows overlooks the sea and islands beyond. There are also two bedrooms on the first floor (one double, one twin). The top floor has two beautiful bathrooms, each with hand-held shower, along with another twin room and family room consisting of twin beds with two additional hand-built box beds (suitable for children only). A large child-friendly garden runs from the front of the house down to Bluemull Sound and the pier at Belmont, where the ferry from Yell docks. One of the pavillions at the side of the house contains a laundry. Local lamb, shellfish and beef can be ordered, and there is also a Farmer's Market once a fortnight in Unst during summer. There is mobile reception (Vodaphone) and broadband at the property.